Do you want to learn two simple ways to keep your skin looking better longer? And wouldn’t it be more fantastic if these courses of action are absolutely pain free, inexpensive, non-surgical and require no down time? Absolutely! What are they, you ask? Minimize sun exposure and regularly (and properly) use an effective broad spectrum sunscreen on a regular basis. Yes, it is that simple! Of course, you will need to stay away from tanning booths as well. Far too many people either do not use sunscreens or use them rarely or ineffectively. The result is that the sun’s ultraviolet rays penetrate into the upper layers of the skin and inflict permanent damage. This manifests as pigmentation irregularities, diffuse wrinkles and creases, loss of elasticity, greater skin laxity and thinness. All the signs of aging. Even worse, is that these same ultraviolet rays can also cause the development of skin cancers including basal cell carcinoma, squamous cell carcinoma and malignant melanoma. This latter skin cancer can lead to a premature, relatively quick death. 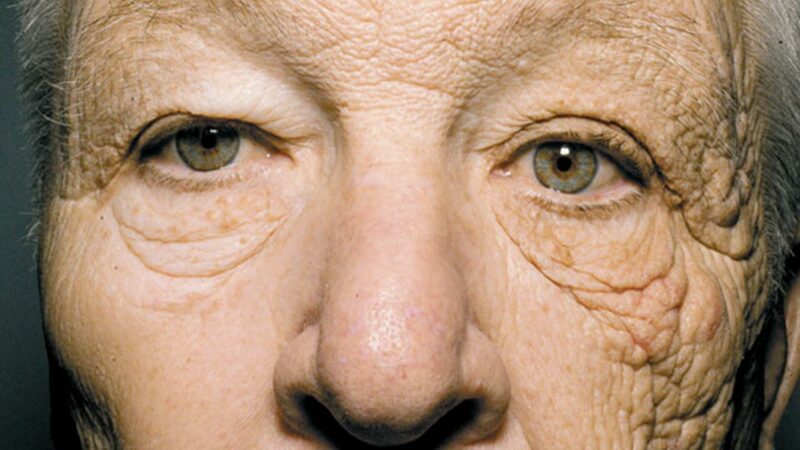 A very dramatic demonstration of the harmful and aging effects of chronic sun exposure involves the unique case of a 69 year old delivery truck driver that was published in the New England Journal of Medicine. The left side of his face was exposed to far more of the sun’s damaging ultraviolet rays through the driver’s side window over a 29 year period than the right side (UVA rays penetrate through glass windows). For 25 years, he noticed a gradual thickening of the skin of the left side of his face that was also associated with increased wrinkling. The picture below graphically illustrates this “astounding” effect and the striking differences between the two sides of his face. If you had ever questioned the validity and wisdom of protecting your skin from sun exposure, this case should dispel any of that doubt. For more information on skin care and our lines of skin care products including sunscreens, please give my office a call at 480-451-3000. We can also answer questions that you have regarding the diagnosis and treatment of skin cancers as well as the treatment options for skin aging including the CO2 laser facial skin rejuvenation.